Constantin Troyon, also called Constant, was born in Sèvres on August 28, 1810. His hometown is associated with centuries-old porcelain manufacturing tradition. In fact both his father and his mother worked in the porcelain company. His mother was a burnisher while his father was a porcelain painter. Constant himself started doing decorations for porcelain pieces at a young age. He received art lessons starting at age seven from the factory director, who was also his godfather. 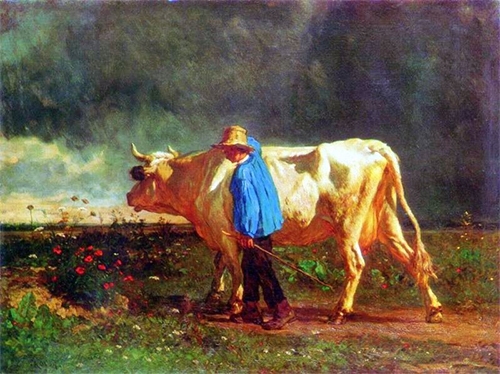 Troyon was distinguished as an animal painter of the first rank although he started out as a landscape painter. He was one of the painters connected with the Barbizon School, who worked in Barbizon, a small village in France and a group of painters who gathered to paint close to the Forest of Fontainebleau. By age 20 he was already working as a landscape artist professionally. He gained international recognition by joining exhibitions overseas, something that he did more than the other artists connected with Barbizon. His first exhibited works were landscapes before he devoted his career to being an animalier or a professional painter of animals. His training as a landscape painter provided him with the skill to render great natural environments with his meticulous and detailed renditions of animals. Constant Troyon joined the Paris Salon exhibitions starting in 1833 even though he was still working at the Sèvres porcelain factory. His first entries were landscape paintings of Saint-Cloud and Sèvres. Because of the similarity in thematic choice he was grouped with Jean-Baptiste-Camille Corot, Théodore Rousseau and Jules Dupré. He later established a stronger relationship with these artists when he joined the Barbizon school. He also traveled around this period, visiting places such as Brittany, the regions around Limousin, Loiret, Orne and Argenton. He did several paintings while traveling, which showed influences of his training in porcelain painting, in the sharpness of execution and the use of intense greens and yellows. He won a medal from the Salon in 1838 and also joined in an exhibition at Amiens, and provincial shows like this boosted his reputation. In 1840, he received another medal from the Salon. The way Troyon and other artists painted their landscapes were considered unconventional at that time, since it deviated from the way academic landscape paintings were created, which were steeped in historical and mythological imagery. The other artists were Jean-Francois Millet, Alexandre Gabriel Décamps, Narcisse Diaz de la Pena, Jules Dupré and Théodore Rousseau, and together with Troyon, formed the nucleus of the new style of painting that the Paris Salons accepted. From being just a loosely formed community, it later evolved into the Barbizon School of Painting. In 1847, Troyon made a trip to Holland, which became the turning point in his career. He became deeply influenced by the works of Paulus Potter and Albert Cuyp, two of the Dutch masters of the 17th century. 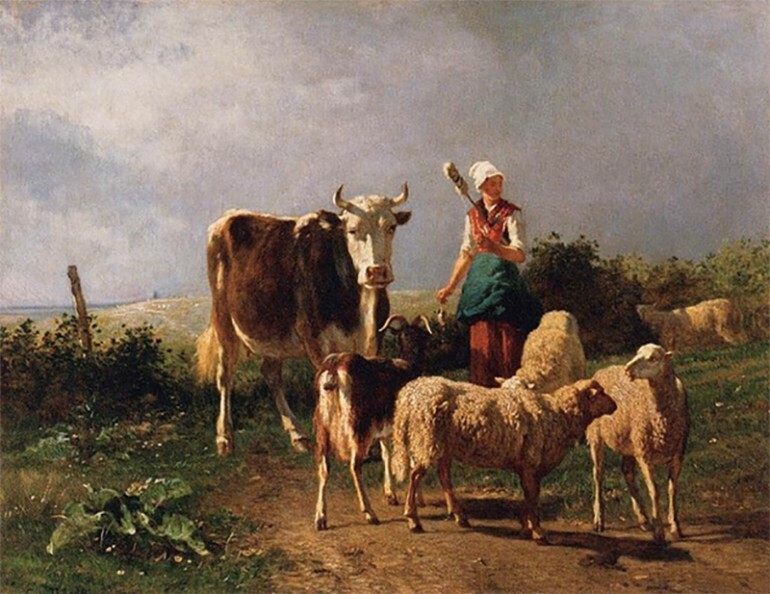 When he returned to France, he started painting animals and soon became a master of animal paintings, depicting animals, particularly cows, with amazing accuracy. His first Salon entry for animal painting was in 1849. Together with Camille Flers and Jules Dupré, he was awarded the Chevalier de la Légion d’Honneur that same year. His reputation was widely acknowledged, that his paintings were already sold before they were started. He was one of the artist who encouraged Claude Monet to take up en plein air painting and also became the teacher of Eugène Boudin. To this day, his unequalled brushstroke skills continue to impress. He was also highly skilled in picture harmonization and color blending and recognized for his magnificent ability to imbue a sense of realism in his works, because he was a painter who did not leave any detail to chance.